Technically, the OrangePI Zero supports a type of Power of Ethernet, but this makes it compliant. 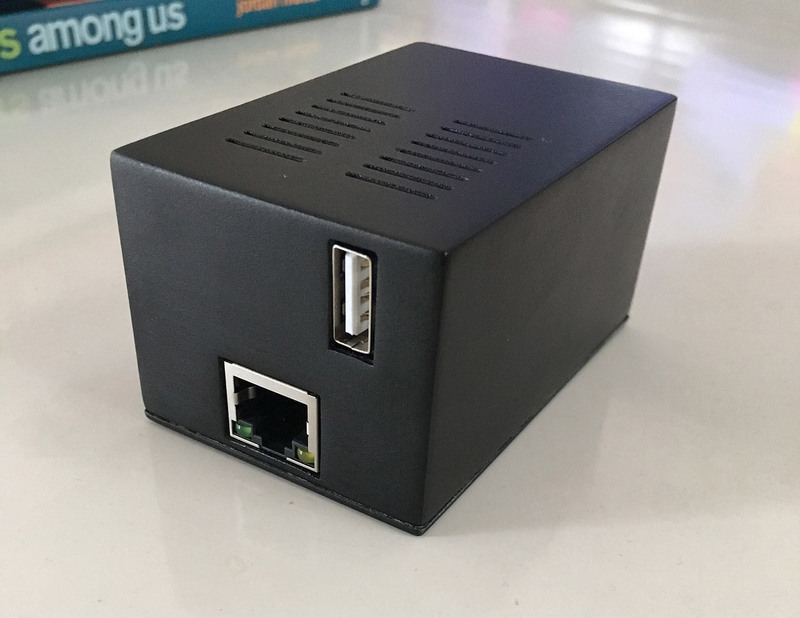 ..and uses a cheat – you can buy POE splitters off Aliexpress – this hack removes the Ethernet port off the OrangePI, and permanently attaches the splitter. 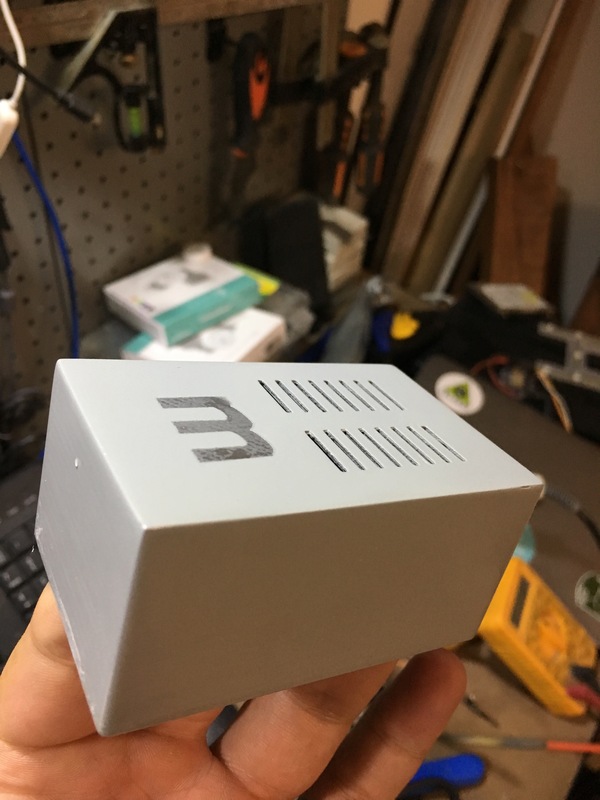 I also 3D printed a case for it, which is the interesting part, as I experiment with post production. I use an OrangePi as a server for my Flic bluetooth buttons. I use POE to power it, so I don’t need to bother with plug packs, however, it all looks a little untidy (why do Pi clone manufacturers always put the power plug on the front!?). I’ve also been meaning to experiment with sanding and spray painting 3D prints, so I thought I’d kill two birds with one stone. 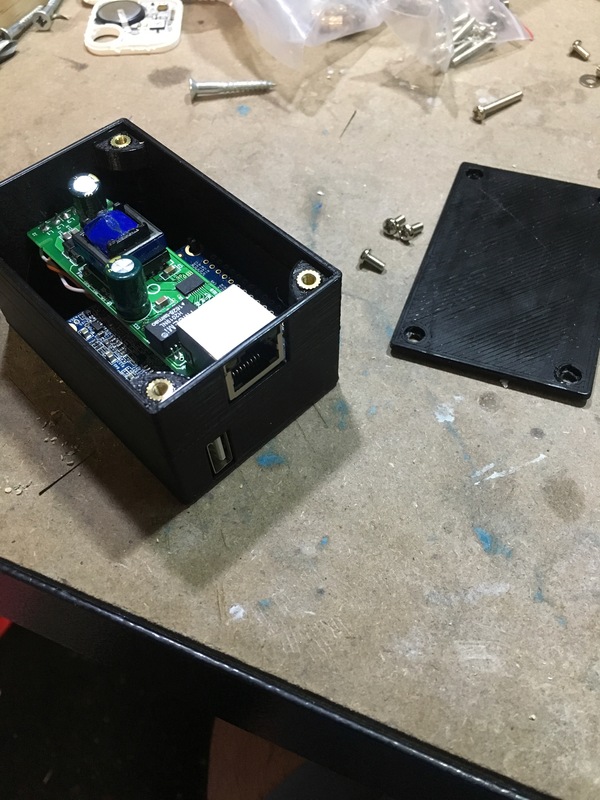 Desolder the Ethernet socket from the OrangePI. I used a desoldering needle. Use ethernet cable to join to the two Ethernet pads. Make sure you maintain the twists between pairs. I also soldered two pin headers into the support holes either side of the Ethernet sockets, to give some physical support. No need for to print supports – 20% infill is fine. Once printed, you need to cut off the board support clips at the top of the pylons – they don’t work. Drill two 2.5mm holes in the two rear pylons. Insert brass inserts into the corner holes. FDM 3D printing is quite streaky, and looks… well, like it was 3D printed. I print in PLA, so acetate vapor is out off the question, making good, old fashioned sanding and painting the easiest way to get it looking it good. The first time I tried this I sanded the thing completely smooth, and it took ages. I found other people have had success using automotive primer/filler which fills smaller scratches. I tried this, but the gaps were too big. I went aggressive, and started with 120grit wet-and-dry sand paper. I added another two coats of primer/filler. Next, I went to town with 400 grit, then 800 grit. I wanted to see if I could paint a logo in the top, so I did an undercoat of satin silver, placed a sticker over it and then painted a top coat of satin grey. The sticker lifted, so the edges off the logo were blurry. I re-sanded with 400-grit to get rid of the paint, and polished again with 800-grit. This time I omitted the extra coat of primer/filler, and just applied two LIGHT coats of flat (matt) black paint. This time the result was great! Matt paint actually fills gaps a little bit, so the result is much better. There are still some visible lines (in the right light), so clearly I need to sand more. Also – I missed some bits on the bottom section. Clearly I still need some practice.